The moment came. A space had cleared at the bar, the girl saw me waiting to be served, approached and we were face to face. She was dressed in black, no frilly collar or neck pendant like the girl in the painting, but her palms were against the edge of the bar and I could see her from behind in the mirror. She had the same red hair cut in a low fringe and tied behind her neck, the strong nose, blushed cheeks and large, sad eyes. It was the fifth or sixth time over a month that she had served me, but the first time that the position was perfect. I stared and smiled. Her accent was Thames Estuary, not French, but I could ignore it. I fumbled with my wallet, paying more attention to her expression. It was just right. I just let my smile grow broader. Her expression changed, conveying a hint of irritation, but I was sure she would forgive me when I explained. She’d appreciate the charm in the explanation. She took two glasses from the shelf below the mirror and moved a couple of feet to the left to pull at the pump. As the first glass filled she glanced at me, a hint of suspicion in her eyes, then stared down as she pulled the second pint. It was only when the drinks were in front of me and she was returning my change that I told her what it was about. It meant nothing to her. I wasn’t put out. Her face was blank. So she wasn’t an art lover. It didn’t matter. New customers were at both of my shoulders. The barmaid looked to the woman to my right and asked what she wanted. She began to serve without a glance towards me. I smiled to myself, thought that I had brought a little something to the barmaid’s life. Maybe she would go to see the painting. Maybe next time I came she would be grateful that I had pointed out the resemblance. I went back to our table. Simon had clearly noticed the conversation. He spoke as if the idea amused him. We sipped at our beers and talked about cricket, while I sneaked a couple of glances at the girl behind the bar. I didn’t notice her looking towards me, but I did see her speak to the pub’s manager. Maybe she was asking if he knew anything about the painting. Simon raised a subject we had spoken about before, the pair of us spending a couple of weeks in the Caribbean the next time England played a test series against the West Indies. It was a nice idea, within our incomes if we looked for cheap flights and hotels, and I was just beginning to take it seriously. Then there was a pat on my shoulder and the manager crouched beside me. Keeley. I didn’t know that was her name. Not at all 1880s Paris. I said that was right. I smiled at him. He was articulate and smartly dressed; I thought he could well know what I had been talking about. He smiled and shook his head. So he knew nothing about art. But surely he would appreciate the charm of the idea. I had to admit that I had stared, but I had to explain that it was to make a point about her resemblance to the girl in the painting. I didn’t know what to say. I was shocked at thinking I could have ‘weirded out’ the girl so badly, and I had never been thrown out of anywhere before. “That’s a bit strong,” Simon said. He stood up and repeated: “Two minutes, and I’m afraid you can’t return.” Then he returned to the bar. “I wonder what ‘appropriate action’ means?” said Simon. He glugged down the rest of his drink. I was too annoyed to touch mine, but when Simon stood I followed. As we left I turned around and looked to the bar. The barmaid was watching. She shot me a filthy look. “You been barred from a pub before?” asked Simon. A few days later I went back to the Courtauld Gallery. The incident in the pub had left me with a lingering sense of embarrassment, even if I had been the victim of ignorance, and I wanted the comfort of the painting. I had always been engrossed in the conviviality of the bar and the sad eyed welcome of the girl, the feeling that she would respond to a small kindness. I went to the first floor, straight to the room where it hung and looked into the girl’s eyes. She wasn’t there. 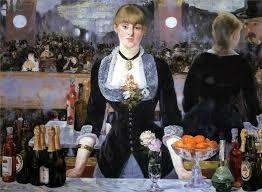 Instead of the vulnerable young woman from 1880s Paris I saw Keeley from the pub in Fulham. On the surface she was the same, but now her eyes were wary, her lips tight. She looked bored and belligerent. I kept looking, trying to find the girl I knew from all the other times I had stared at the painting; but Keeley remained, her expression hinting at a sneer. Her voice was in my head, but I couldn’t ignore it. I shook my head, and almost expected to feel the pub manager’s hand on my shoulder. Keeley kept staring at me. I turned around and walked out of the room. I barred myself from the gallery.